There is a lot of day-to-day grind as a PM. Tickets to write, bugs to triage, meetings to facilitate. Maybe the QA team needs help. Maybe the marketing manager is sick and you need to help run an acquisition campaign. There is always something urgent that needs your attention, your time and your focus. Indeed, good PMs do whatever needs to be done to get the product shipped. Great PMs can simultaneously live in the present (this week/next week), the mid-term future (next month) and the long-term future (next quarter/next year). Great PMs can move gracefully through the temporal roadmap multiple times per week. We live in the present, but we can only intelligently choose what to focus on today by thinking about it in terms of the future: where are we going, what are we trying to achieve, what’s coming next. Great product teams don’t get stuck iterating the current product forever: the future always comes quicker than we think. So how do you know if you’re not spending enough time thinking about the future? How much is too much? 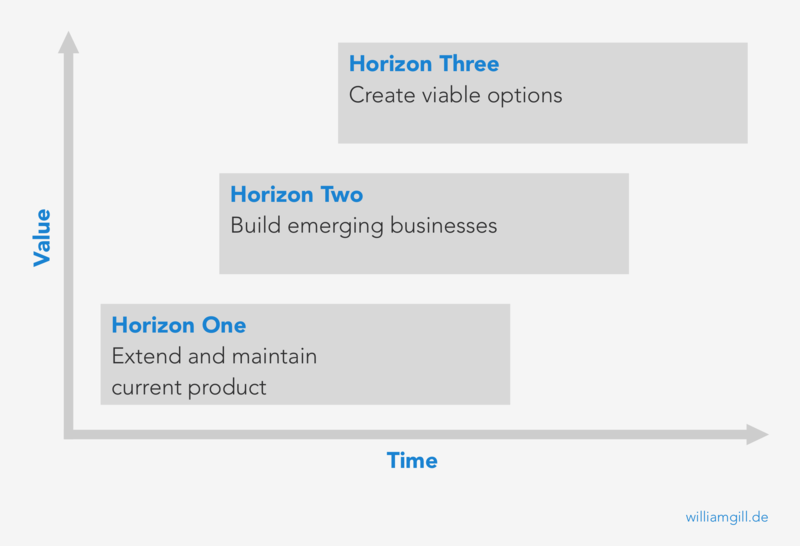 When thinking about this for Product, I like to think of the Three Horizon Model. I first came across this model in the Pragmatic Marketing course. The model was originally designed as a sort of counterpart to the BCG Matrix Model to describe how businesses should invest in product lines over time – making sure to avoid future disruption by investing in future businesses. But I find the model works well at lower abstraction levels, as an abstract way to think about how to invest product time across the three time horizons. Here’s how it works: For given product, you’ll probably spend around 25% maintaining your current product version. This is Horizon One. This is the product you have in the market right now. This 25% of time might be spent on maintaining your production services, implementing bug fixes, reducing your technical debt or on customer support. Horizon Two is about the next big thing. A good team should be spending around 65% of their time working on the second horizon: the next product. This could be the next major feature, the next market segment or problem that you’re going to solve. This is your investment in the immediate future: what’s coming next. Finally at least 10% of your time you should be thinking about the longer-term future: Horizon Three. What is the next market segment you plan to enter? What new technology might change the way you do business or build your product? What environmental changes do you need to prepare for? The great thing about this model is that you can apply it to any role within a team and it makes sense: for PMs, for QA, for engineers. You an also apply it to any level of the business: at the relatively low level of the product backlog, or to the product strategy, or to the business itself. The future always comes around quicker than you think, and you don’t want to be caught unprepared. Get done what needs to get done, but don’t get stuck in the present. Remember to invest in the future. This entry was posted in Product Management and tagged Product Management, strategy. Bookmark the permalink.